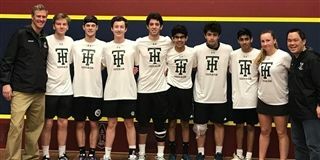 The Tower Hill Squash team traveled to Hartford, Connecticut, to compete in the U.S. High School Squash Nationals. Coming off their win last year in Division 5, the team was placed in Division 4 this year. The Hillers won their first match against the Kent School to advance to the quarter finals against SquashBusters of Boston. The team lost a very close match, 4-3. The SquashBusters went on to win the championship. The Hillers then went on to defeat St. Paul's (Maryland) and St. Christopher (Virginia) by 5-2 margins to claim 5th place in their 16-team draw.